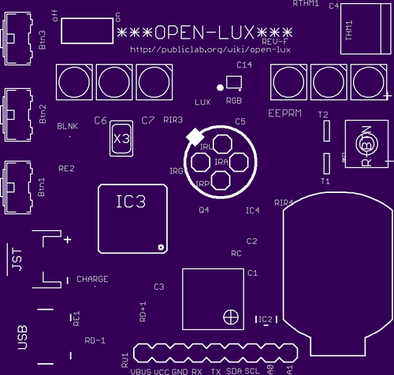  Public Lab: Open-Lux REV-F: "NeoPixel" Fiesta! other fantast(-y / -ical) applications? 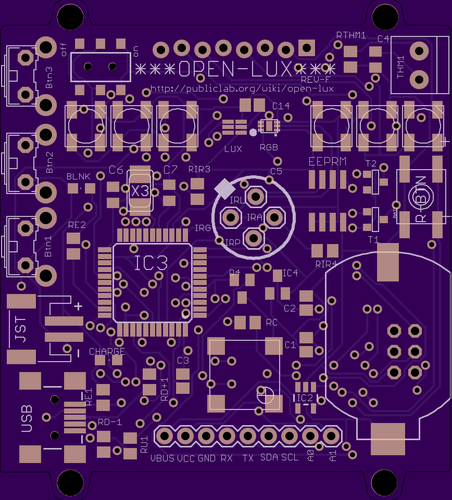 This is to post what has changed in the latest revision, Open-Lux REV-F, which I think might be the final revision before ordering a few prototypes. I realized, after some thought, that having a standard USB interface (rather than virtual USB with a 328P chip, as cool as that approach was)) would be really handy, and would likely make debugging and getting data off the board easier for most folks. So I've switched to the 32u4 chip -- the same chip used in the Arduino Leonardo. I've added some mosfets in order to allow us to turn the Nokia 5110 display (located on the back of the board) on and off (to conserve power in some cases) by pulling a digital pin low; I've done the same for power to the LED on the display. I've added three buttons to the board, which will stick out to one side of the device. This should allow for e.g. setting temperature thresholds interactively, changing display or sensing modes; or scrolling through menus on the display. I've added 128k of EEPROM memory to the board, so we can store setting settings like temperature thresholds (rather than have to reprogram the device with a laptop when we want new settings). We've also exposed VBUS (the raw voltage into the device), VCC (3.3V), GND, RX, TX, SDA, SCL, A0, and A1. The hope is that this will a) allow us to e.g. drive strips of LEDs if we need brighter displays (as in the thermal flashlight case) b) connect to a Raspberry Pi via serial (if we want to use this device as a peripheral), connect any I2C device we like (over SDA and SCL), or otherwise use the analog/digital capabilities of the A0 and A1 pins. Sekjal posted a wonderful research note](http://publiclab.org/notes/sekjal/04-15-2014/thermal-flashlight-reva-reading-changes-over-distance) in which he assessed the sensitivity of the onboard IR sensor as a function of distance from a measured object, using a homemade Lego contraption that allowed him to adjust this distance quite precisely. Sekjal suggested that we add holes on the device that would accommodate a Lego 3mm rod, and that the spacing between the holes be a multiple of the standard 8mm spacing between Lego device holes. Accordingly, we've now got four tabs on the device with holes 3 mm in diameter, and they are 48, and 71 'lego spacings' away from one another in the horizontal and vertical directions, respectively. Whee! 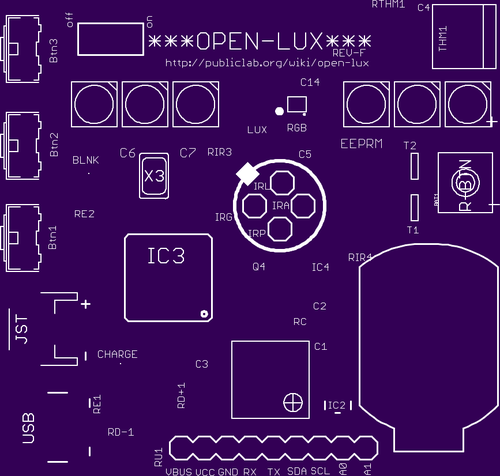 Here's a link to the OpenLux REV-F schematic, as well as the board layout, in the Open-Lux REVF repo github. If anyone sees anything goofy in these designs, let me know ... otherwise I think I'm ready to order some boards and see if it works? Can't wait to get my hands on the updated version and build some sweet Lego cases/containers/contraptions!